It's a busy time of year for milliners, the wedding season's in full swing, garden parties are taking hold, race meetings galor and the one and only Royal Ascot just around the corner! Here at Sara Gadd Millinery it's no exception and we are in a creative frenzie every day! In addition to creating headwear, Sara has been spreading the 'hatty word' appearing as guest speaker for many local groups...it's been a busy season! It's been great fun meeting lots of new faces, handing our hat advice, oh and sampling many a wonderful cake! Last month Sara Gadd Millinery teamed up with Pink Tulip Photography in a wonderful vintage bridal boutique photoshoot. Make up featured by Bridget Foster and our bequtiful models were Jeni Banks of Mayfifteen and Michelle Serrechia. Here are a few images, they will also be featuring on the updated website soon! Warwick Hall was our stunning venue for the shoot and we were so lucky with beautiful weather! 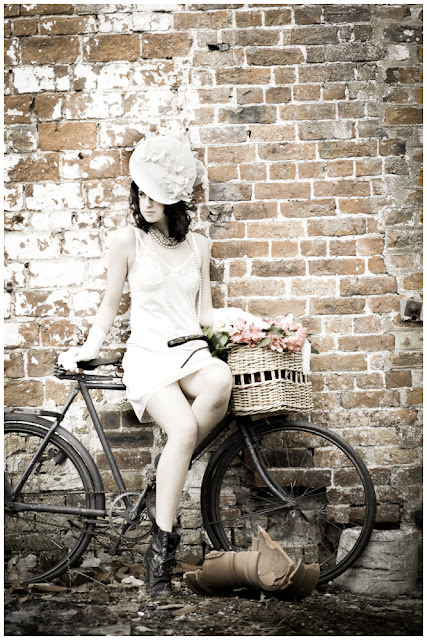 A collection of my family vintage pieces helped with styling the shoot which also included this wonderful vintage bike! The shoots really created excellent results and I look forward to working with Pink Tulip again in the future. *1st July - 4th July Garden Festival at Warwick Hall. 'Hats in Action' testimonial web page. Have you been a Sara Gadd Millinery lady? Like to feature? Just email an image of you wearing your creation to Sara, we'd love to see you on there! Ladies don't leave you hat to the last minute, is the important finishing touch to your outfit so time, planning and carefull consideration is needed! Why not visit us or email for details!